A game-related alteration to Bing's search results could greatly reduce the productivity of its users. The Bing Games section just became a whole lot easier to fall into. Bing is now embedding links to games such as Bejeweled 3 and Plants vs Zombies directly in its search results, with the games opening up right in the search page. Most of the time you'll have to search for a particular game to get a link. 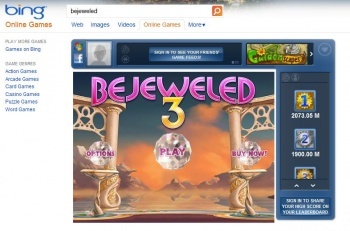 Searching for "jewels" doesn't appear to result in a direct link to open Bejeweled. Searching for "plants" and "zombies" doesn't either (your search has to say "plants vs zombies"). However, searching for "balloons" brings up Bloons, so inadvertent game playing is somewhat inevitable as the offerings expand. There are over 40 games in total that could pop up in your results. Other games include versions of Mahjong and Solitaire, Cake Mania, Hexic, Zuma's Revenge, and even hidden object games like Samantha Swift. They're free-to-play, though sometimes an advertisement will appear just like when you watch Hulu or another form of streaming media online. If anything could make our generation's attention span worse, it's playing games within our search results. We're distracted enough by the internet, we don't need Bejeweled drawing us away from simple tasks like looking up the definition of "toothsome." Who can resist a quick game of jewel-matching delight when it's right there staring you in the face?